Are you the type of person who loves when the world outside turns into a Winter Wonderland? Or would you rather winter ended right after Christmas? No matter your feelings on winter, it’s likely that you will spend time in the next month or so shoveling snow. You may also take the kids sledding at their favorite hill in your neighborhood. And, you might squeeze in a trip to the mountains for some skiing – or to the ice rink for some skating. These winter activities are notable because we usually only participate in them three months out of year. In the nine months in between, we forget how to shovel snow without hurting our backs, or how to step out onto the ice without tweaking a hip flexor. Winter wellness is about more than just avoiding the sniffles or the flu – it’s about staying healthy and strong while participating in the typical outdoor winter activities. Here’s how. If you’ve ever considered shoveling your driveway without bundling up first, remember that doing so can increase your chances of injury and cause pain. When your body is out in the cold, your muscles and blood vessels will contract in order to conserve heat. Once contracted, the muscles and blood vessels in your extremities receive less blood supply. You’ve probably already experienced the tips of your fingers and toes going numb after extended periods of time in the cold – that’s because of the contraction of your muscles in the cold. The biggest potential problem of being under-dressed in the elements is that the functional capacity of your muscles is reduced, meaning they are more likely to become injured. Dress appropriately for the weather you’ll be in, wearing layers if you plan to move indoors and out with some frequency. By dressing warmly, you’ll keep your muscles warm and flexible, and flexible muscles are harder to injure. The number one thing to do to prevent injury is to warm up. You’re probably already warming up before any physical activity at the gym, but do you warm up your muscles before skating at the outdoor rink in your neighborhood? Follow the tips below to prepare your body for the specific activity that you’re about to engage in. Lay on your back and pull your knees to your chest. Hold for 30 seconds. This knee-to-chest stretch will stretch out your low back, thus making it easier for your body to fight compression injuries as you bounce over the snow on your sled. Before you run (or trudge) back up the hill, do another knee-to-chest stretch to make sure you’re limber for the next time down. Lunge forward by stepping out with your right leg. Slowly lower your left knee to the floor. Hold, but make sure to stay upright with your shoulders over your hips. Once you feel your hip flexor loosen up, switch legs. Try doing several lunges on each side before stepping out onto the ice. Squat low, keeping your legs shoulder-width apart and your knees over your feet. Do 10 to 15 of these and do them slowly. Squatting is a great lower-body warm up that will activate the muscles in your calves, hamstrings, quadriceps and glutes without tiring them before you hit the slopes. 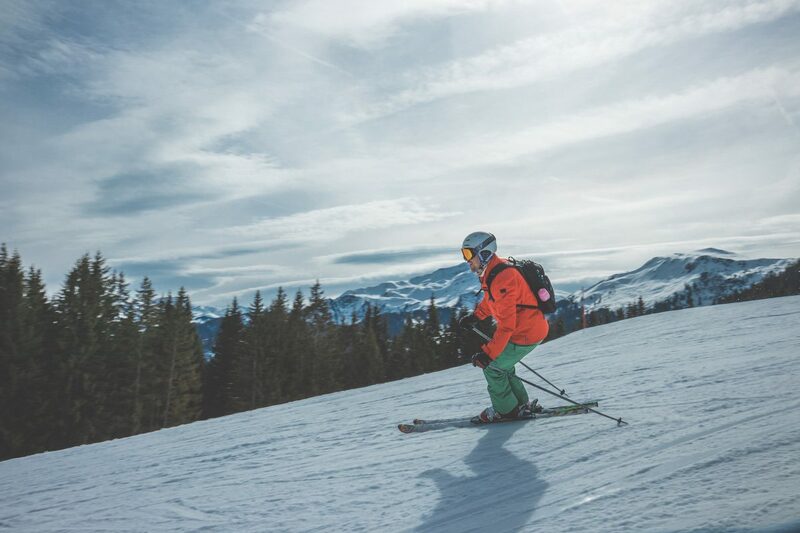 Once you get to the bottom of the hill or mountain, do a couple more squats in your skis to ensure you won’t stiffen up by the time you’re back at the summit. Shoveling is an all-body workout, so apply the stretches that you’ve learned for sledding, skating and skiing before your next shoveling workout. Pay special attention to stretching out your upper and lower back, glutes and legs, as these are the areas mostly likely to become strained. Remember to lift your shovel only when necessary and to do so with your legs, not your back. Don’t twist and turn while shoveling, but instead push the snow straight ahead whenever possible. Take breaks when you need to – there’s no harm in going inside to warm up before hitting the slopes again or completing the snow removal of the back half of your driveway. Staying well-rested will prevent fatigued muscles from spasming, straining or becoming sprained. Muscle soreness is typical after new or abnormal activity. If your muscle soreness and fatigue continue for more than a few days, however, it may be time to visit Van Ness Chiropractic. Drs. Van Ness, Parkin and Sabri will get you out of pain and back into your daily life quickly and efficiently. 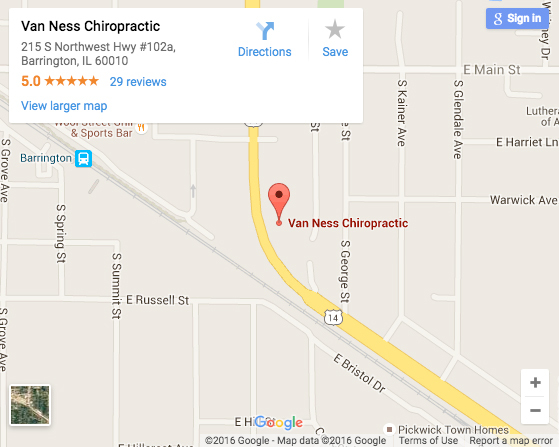 To schedule an appointment, call 847-842-8070 or click here.